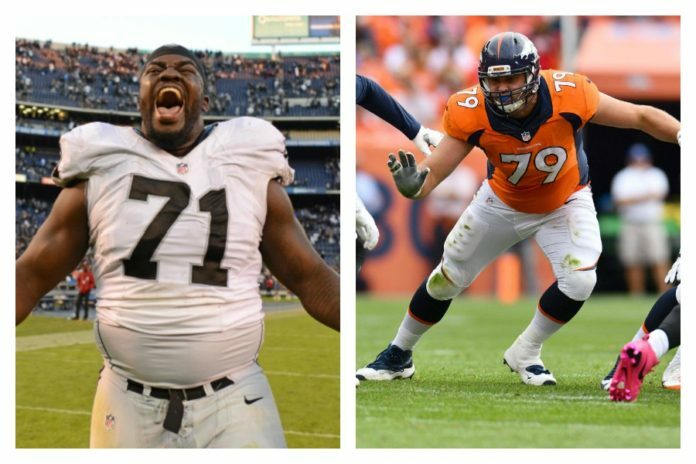 While the Denver Broncos drafted their left tackle of the future in tackle Garett Bolles, some still wonder if they truly addressed the the other tackle position when they signed former Oakland Raider Menelik Watson this offseason. In 2016, the combination of Ty Sambrailo and Donald Stephenson left much to be desired after the team saw consistent pressure to the quarterback off the right side of the line. In an effort to solidify the offensive line, the Broncos signed two players in free agency. The first was former Dallas Cowboys guard Ronald Leary. Leary is in line to be a solid piece for a Broncos line that is still growing and learning to play as a unit. The second, Watson, has the potential to be the answer the Broncos have been at the right tackle position. The Broncos got a first-hand look at what kind of player Watson is playing against him twice a year while he was on the Raiders. But Watson has a significant injury history, which has caused him to miss numerous games while with the Raiders. Last season, he played in only 10 games. In his NFL career he’s played 27 of 48 possible games (and that’s not including when he missed all of 2015 with a torn achilles). If Watson can stay healthy, his incredible athletic ability to mirror pass rushers will prove effective against an AFC West division loaded with them. His quick feet and natural speed will also help free up holes for the running game. And of course, Watson has the nasty attitude that general manager John Elway has coveted in his recent offensive line acquisitions. This playing style alone brings the Broncos something they seemed to lack on the o-line last season – a fight-for-each-other mentality that turned fair offensive lines to good ones and good offensive lines to great ones. The thought of having a bookend right tackle to complement Bolles on the left side for the next few years all hinge on Watson’s ability to stay healthy. There is legitimate reason for concern. His injury chart in his four years in the league is a long one. Knee, calf and illness his rookie season. Hip, concussion, foot and ankle in his second year. A torn achilles that cost him all of year three. Groin and calf problems last year. Fortunately, the Broncos have depth at the position if Watson’s injuries return and cause him to miss playing time. Sambrailo and Stephenson are getting looks at left tackle while Bolles tries to get up to speed in the NFL. The duo has even been competing for first team reps during OTAs. But both players have spent time on the right side of the offensive line in their careers. In a pinch, Sambrailo and Stephenson could see playing time at right tackle. Another name that many fans should be familiar with is offensive lineman Michael Schofield. Schofield has been playing both the guard and tackle his entire football career, starting at Michigan. Last season, Schofield played primarily the guard position, where he started and played in all 16 games, but he also has experience playing the tackle position as well. Schofield’s play last season improved immensely from the player he was his rookie season, where he struggled to pick up the pace of an NFL game. He has been lining up primarily at the guard position during OTAs, but his experience and flexibility on the offensive line will provide depth at the right tackle position should his number be called. The tandem of Garett Bolles and Menelik Watson would be the ideal situation for the Broncos heading into 2017, but to the relief of fans everywhere, there are options for the Broncos at right tackle heading into the 2017 season.